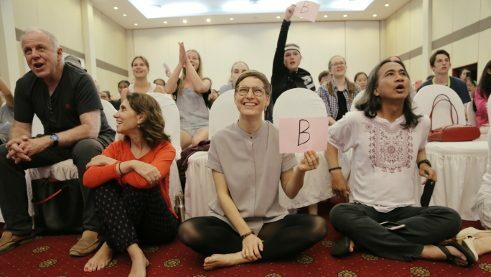 Asia-Pacific German Olympics "The best week of my life"
​Getting to know and learn from one another in German, 8,000 kilometres from Germany. 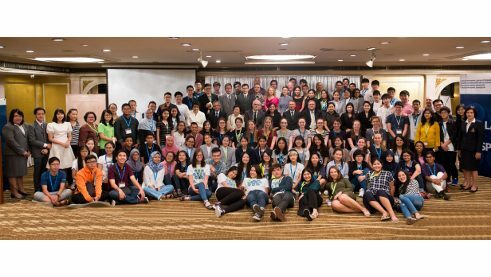 Seventy-seven pupils from ten countries met in Thailand for the first Asia-Pacific German Olympics. German disco in the middle of Bangkok: The dance hit “So ein schöner Tag” booms from the speakers and nearly one hundred teenagers – not one of them from Germany – sing along at the top of their lungs. 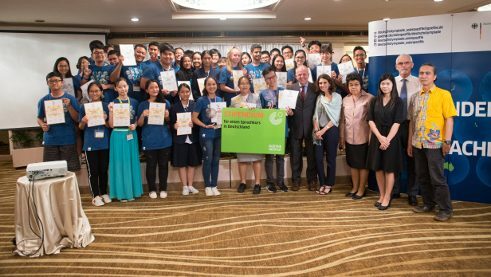 They are from ten countries and all took part in the Asia-Pacific German Olympics organised by the Goethe-Institut and the Thai Association of German Teachers. After more than a week of learning and living together they are celebrating themselves and their new friends. Nguyễn Tất Hoàng Long from Ho-Chi-Minh-City can barely believe that he has won the second prize. Group picture with guests of honor. The students get to know each other in different games. The six members of the jury. The competition begins. The students have to interview each other about their home countries. The participants hold group presentations in the second part of the competition. 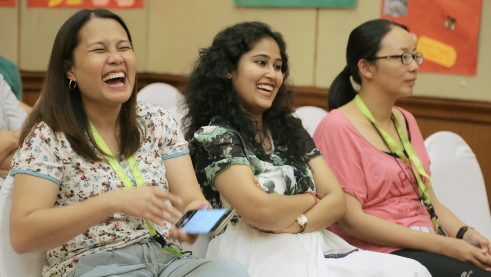 The teachers enjoy the presentations. Australia prepared a quiz and everyone is taking part in it. …and the group of level A2 with the winners. Among the dancers is Nguyễn Tất Hoàng Long, who was shedding tears only a few minutes ago when he heard that he’d reached second place in beginners’ level A1. 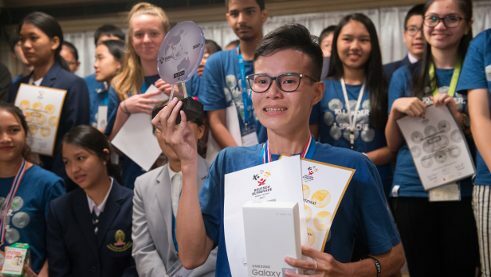 “The contest was pretty hard,” reports the 16-year-old from Vietnam who wants to study biotechnology in Heidelberg. 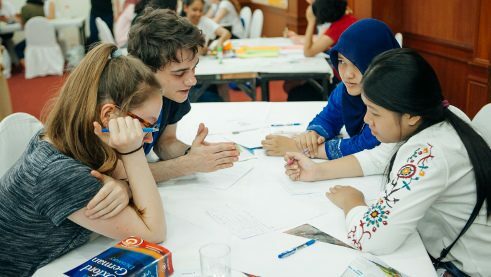 During his holidays he goes to Ho Chi Minh City every day to learn at the Goethe-Institut so he can fulfil his big dream. 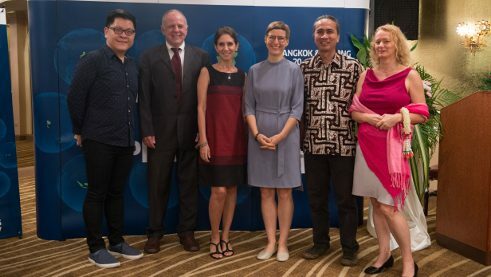 In addition to Vietnam and, of course, the host country of Thailand, the Olympics were attended by pupils from Australia, China, India, Indonesia, Japan, Malaysia, New Zealand and the Philippines. 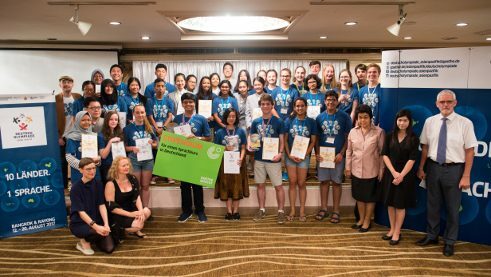 Their tasks for the competitions in Bangkok and the coastal city of Rayong included designing a wall newspaper as a team, holding a presentation for the jury and even showing off their athletic ability in a station course. “My feet and legs really hurt from running so much,” says Nguyễn Tất Hoàng Long right before the victory ceremony. “This week was totally super-cool,” sighs Lucy Matehaere. “I met so many people from other countries and now I know so much about different cultures,” continues the 16-year-old from New Zealand’s south island, who would like to compete as a canoeist in the 2024 Olympic Games in Paris and hopes to do her training for it in Germany.